Update: The issue has now been resolved, the agency said. 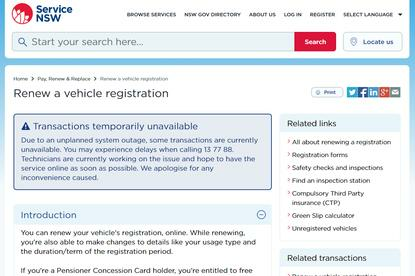 Service NSW is unable to accept payments online or over the counter due to an “unplanned system outage,” the agency has said. The state government agency said that the issue has also affected its call centre. “Please delay your transactions until further notice,” a Service NSW statement said. “Technicians are currently working on the issue and hope to have the service online as soon as possible,” Service NSW said in a message on its website. Service NSW has been contacted for comment. The NSW government is aiming to have 70 per cent of government transactions conducted via digital channels by 2019 as one of 12 ‘Premier’s Priorities’. Update, 2:50PM AEST: “We experienced a connectivity issue which impacted multiple services,” a Service NSW spokesperson told Computerworld.